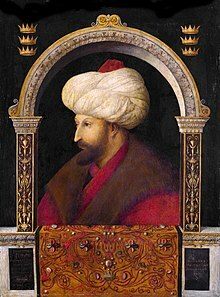 Constantine XI Dragases Palaiologos, Latinized as Palaeologus was the last reigning Roman and Byzantine Emperor, ruling as a member of the Palaiologos dynasty from 1449 to his death in battle at the fall of Constantinople in 1453. The Walls of Constantinople are a series of defensive stone walls that have surrounded and protected the city of Constantinople since its founding as the new capital of the Roman Empire by Constantine the Great. With numerous additions and modifications during their history, they were the last great fortification system of antiquity, and one of the most complex and elaborate systems ever built. Galata was a neighbourhood opposite Constantinople, located at the northern shore of the Golden Horn, the inlet which separates it from the historic peninsula of old Constantinople. The Golden Horn is crossed by several bridges, most notably the Galata Bridge. The medieval citadel of Galata was a colony of the Republic of Genoa between 1273 and 1453. The famous Galata Tower was built by the Genoese in 1348 at the northernmost and highest point of the citadel. At present, Galata is a quarter within the borough of Beyoğlu (Pera) in Istanbul, and is known as Karaköy. 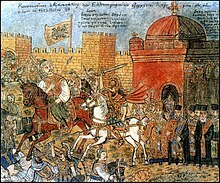 There were many sieges of Constantinople during the history of the Byzantine Empire. 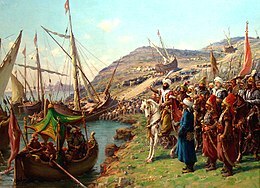 Two of them resulted in the capture of Constantinople from Byzantine rule: in 1204 by the Fourth Crusade, and in 1453 by the Ottoman Empire under Mehmed II. Zaganos Pasha was an Ottoman military commander, with the titles and ranks of kapudan pasha and the highest military rank, grand vizier, during the reign of Sultan Mehmed II "the Conqueror". 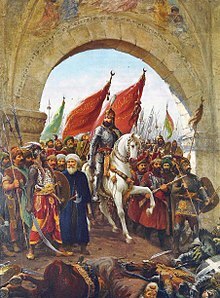 Originally a Christian who was conscripted and converted through the devşirme system, he became a Muslim and rose through the ranks of the janissaries. He became one of the prominent military commanders of Mehmed II and a lala – the sultan's advisor, mentor, tutor, councillor, protector, all at once. He removed his rival, the previous Grand Vizier Çandarlı Halil Pasha the Younger, amid the fall of Constantinople. He later served as the governor of Thessaly of Macedonia. The city today known as Istanbul has been the site of human settlement for approximately three thousand years. The settlement was founded by Thracian tribes between the 13th and 11th centuries BC, whose earliest known name is Lygos. It was colonised by the Greeks in the 7th century BC. It fell to the Roman Empire in AD 196, and was known as Byzantium until 330, when it was renamed Constantinople and made the new capital of the Roman Empire. During late antiquity, the city rose to be the largest of the western world, with a population peaking at close to half a million people. 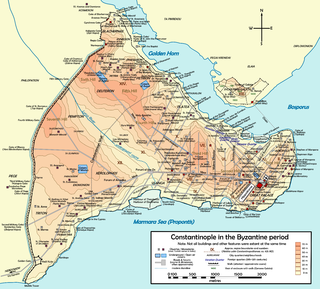 Constantinople was the capital of the Byzantine Empire, which ended with the Muslim conquest in 1453. Constantinople then became the capital of the Ottoman Empire. Yoros Castle is a Byzantine ruined castle at the confluence of the Bosphorus and the Black Sea, to the north of Joshua's Hill, in Istanbul, Turkey. It is also commonly referred to as the Genoese Castle, due to Genoa’s possession of it in the mid-15th century. 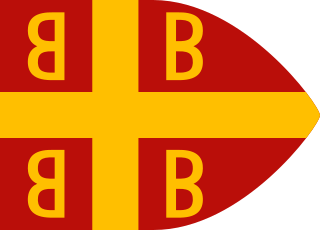 The Palaiologan army refers to the military forces of the Byzantine Empire under the rule of the Palaiologos dynasty, from the late 13th century to its final collapse in the mid-15th century. The army was a direct continuation of the forces of the Empire of Nicaea, which itself was a fractured component of the formidable Komnenian army of the 12th century. Under the first Palaiologan emperor, Michael VIII, the army's role took an increasingly offensive role whilst the naval forces of the empire, weakened since the days of Andronikos I Komnenos, were boosted to include thousands of skilled sailors and some 80 ships. Due to the lack of land to support the army, the empire required the use of large numbers of mercenaries. The Architecture of Istanbul describes a large mixture of structures which reflect the many influences that have made an indelible mark in all districts of the city. The ancient part of the city is still partially surrounded by the Walls of Constantinople, erected in 5th century by the Emperor Theodosius II to protect the city from invasion. The architecture inside the city proper contains buildings, statues, and functional constructions which came from Byzantine, Genoese, Ottoman, and modern Turkish sources. The city has many architecturally significant entities. Throughout its long history, Istanbul has acquired a reputation for being a cultural and ethnic melting pot. As a result, there are many historical mosques, churches, synagogues, palaces, castles and towers to visit in the city. 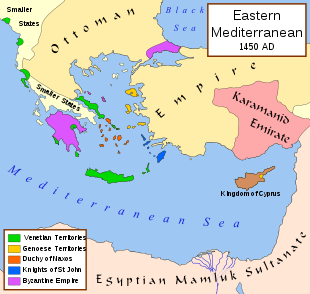 The Siege of Constantinople in 1203 was a Crusader siege of the capital of the Byzantine Empire, in support of the deposed emperor Isaac II Angelos and his son Alexios IV Angelos. 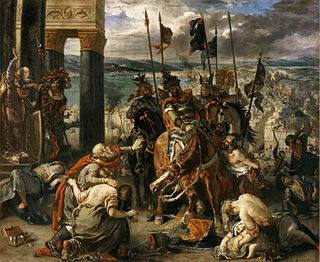 It marked the main outcome of the Fourth Crusade.